DESOTEC activated carbon solutions are used to remove several types of compounds from different types of gases. To further enhance the properties of activated carbon for gas purification, we impregnate the activated carbon with chemicals. This results in chemisorption, which reinforces the activated carbon’s removal properties. Mobile biogas filtration system Siloxanes, hydrogensulphide (H2S) and terpenes removal from biogas. 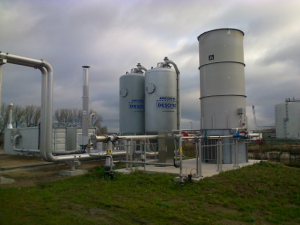 DESOTEC activated carbon also provides a range of mobile filters that are used in gas purification applications. We supply our mobile filters with high-end activated carbon and/or other filtration media depending on the applications that they are used in. As your partner in industrial purification solutions, we offer a closed loop service which includes the treatment and recycling of the used media. Through constant research and product innovation, we succeed in developing highly efficient and environment-friendly filtration solutions for industrial gas purification. Do not hesitate to contact us for more info!